All this to tell you that last weekend I took a walk along a section of Coshocton’s beautiful River Trail. I was not yet thinking of Tom Hanks, Milk Sickness or my metaphor. Or perhaps the latter, because aren’t we always thinking in metaphor? Here I was planning a lovely blog about autumn in Coshocton and now I’m obsessing over “milk sickness” in the mid-1800s. Well, I suppose at least it’s still regional, in that most of the deaths were in the Ohio River Valley, but even more interestingly, it seems that one of the most infamous cases of death by flower relates to the mother of Abraham Lincoln: Nancy Hanks Lincoln. How did she die from this plant, you ask? Well, apparently (you might have guessed by the nickname) from drinking milk of a poisoned animal. Animals get a disease called trembles, and it passes into their milk and then into humans, in what was aptly called milk sickness, and killed off as much as 50% of the ORV region population in the mid-1800s. What the…? Could I get milk sickness today??? I’m not a big milk drinker, but I’m a big curiosity-killed-the-cat (or at least an entire morning of blogging) person. 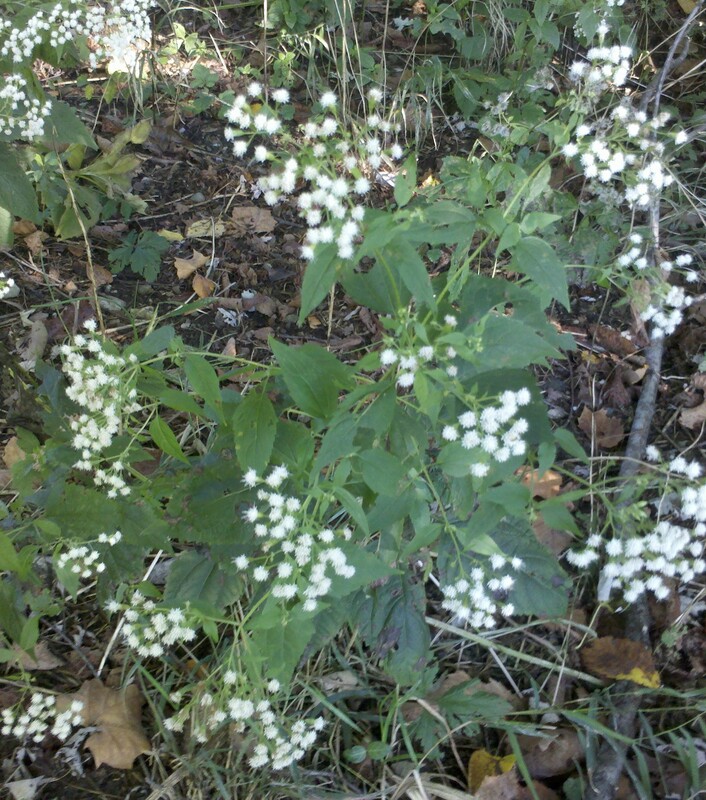 White snakeroot? The search to identify this pretty little flower took me on a strange writing journey this morning. Ooh, now I’m really interested. Tom Hanks too? Then I continue reading. 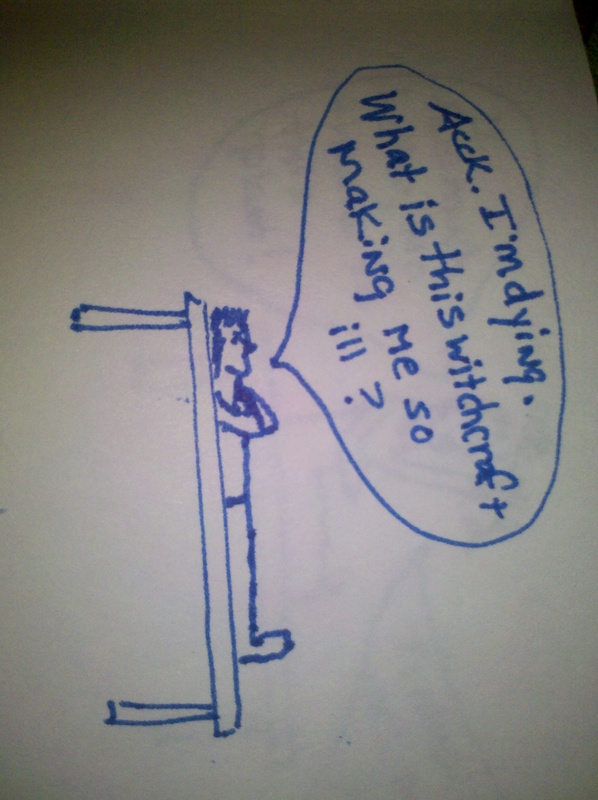 You know, in craft courses, you learn about creating a great introductory sentence to draw in your readers. But you also learn that you better fulfill that contract you set up. For me, St. Cloud bombed this one. My expectation as a reader was this: since the article was about White Snakeroot, Tom Hanks’ connection was to the subject, the plant, not to the trivia that he was related to Abraham Lincoln’s mother. So, um, yeah, technically they all have poor, dead, Nancy Hanks Lincoln in common, but really, St. Cloud? Great setup. Lame execution. It ends with asking me to contemplate the “six degrees of separation” between all parties mentioned in the article, its impact on American history and what I should think while looking at the plant. All right, well, I have to admit to an admiration for this last bit about the degrees of separation. Kudos to Professor Saupe (article writer) for that connection. HOWEVER (and this is a key “however”) the game is really inauthentic without finishing by connecting Tom Hanks back to Kevin Bacon in Apollo 13, in which there was no milk sickness or white snakeroot. Of course, there is an Apollo 13 Drinking Game which, if played correctly, can cause alcohol sickness. However, to honor the sensationalism of the article’s opening line, I think I’ll re-title my blog from its presently lame “Clinging to Summer” to the now hook-y “Tom Hanks has Nothing to Do with My Milk Sickness Metaphor.” Done. Thank you. I will suckle the readers as well, and perhaps cruelly drag in some starry-eyed Tom Hanks fan, only to betray them with anecdotal trivia later on. And, surprisingly, I’ll be okay with that. And as usual, I’ll forgive my initial reaction to St. Cloud and actually appreciate the idea. Back to execution, you say? Can white snakeroot still kill me today? I’m getting there. But first, I’m thinking maybe a better title for that article could have been “Love in the time of Milk Sickness” and we could ponder just how far the trickle-down impact of milk sickness could go. Hooray! As an avid proponent of raw milk (milked correctly and sanitarily, of course) I’m happy to continue my pursuit of healthy bacteria without the added concern of milk sickness (er, if and when I actually drink milk, that is). Thankfully for the people of the 1800s, there was the legend/fact/historical figure-turned myth, Dr. Anna Bixby, who discovered the origins of milk sickness. Apparently she went into the woods searching for a cause, ran into some Native American healer lady who had already known the answer from having, well, generations of knowledge about her country, was nice enough to pass the knowledge on to Dr. Anna, who passed it on to soldiers and friends, neighbors and passersby. Of course the story of Anna Bixby goes beyond just the milk sickness diagnosis. There’s a whole weird scenario surrounding a cave, whiskey bootlegging, murder, ghosts, etc. on a site called Prairie Ghosts. Such a fascinating study. I wonder if such a thing could be applied to the study of other natural plants and on a much larger scale. I wonder if such a thing could be applied to the medicinal aspects of plants as well. Naw, can’t be. If we could study the medicinal properties of plants in the same way double-blind studies are done on synthetic pharmaceuticals, we would have already done so. Sheesh. What was I thinking? Wait a minute. An eradication program? In the mid-1800s? Without pesticides? What a tedious way to solve the problem: pulling weeds by hand as they appear. Who wants to do something like that when chemicals can be applied for a faster result? In another thought, am I the only one who wonders whether or not the old Native American healer did the right thing in giving away that knowledge to the people who would wipe hers out? Was Dr. Anna stupid in not finding a way to profit from her knowledge instead of giving it away, only to have a bunch of old men give official credence to the plant’s toxicity nearly 70 years later? Oops – silly me. I was interpreting and paraphrasing that story. I suppose you should have the opportunity to read it without my summary and suggestion. Apparently Marla is in a really strange and somewhat snarky mood today. 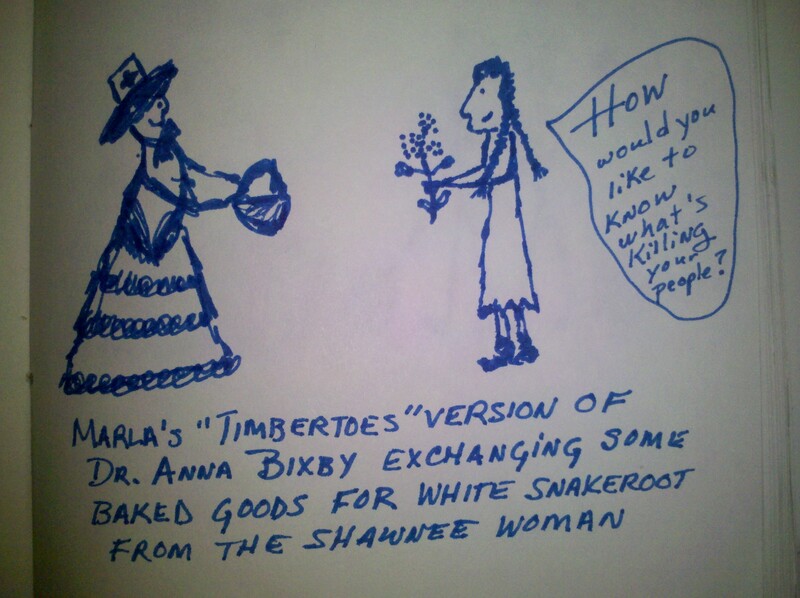 Wait, if Dr. Anna and her crew had early success eradicating white snakeroot in the mid-1800s, why is it still prevalent today? Why is it more prevalent? Didn’t America just adopt the practice of continuing to pull these deadly plants as they appeared? “Animal husbandry?” That’s kind of a generic catch-all, don’t you think? What do they mean by that? Are they running around cow-tipping Bessie to keep her from tasting some pretty little white flowers she noticed over by the fence? Are they crop-blasting her big, beautiful cow arse in an attempt to kill off the bad weeds? Egads this rabbit hole just never ends! 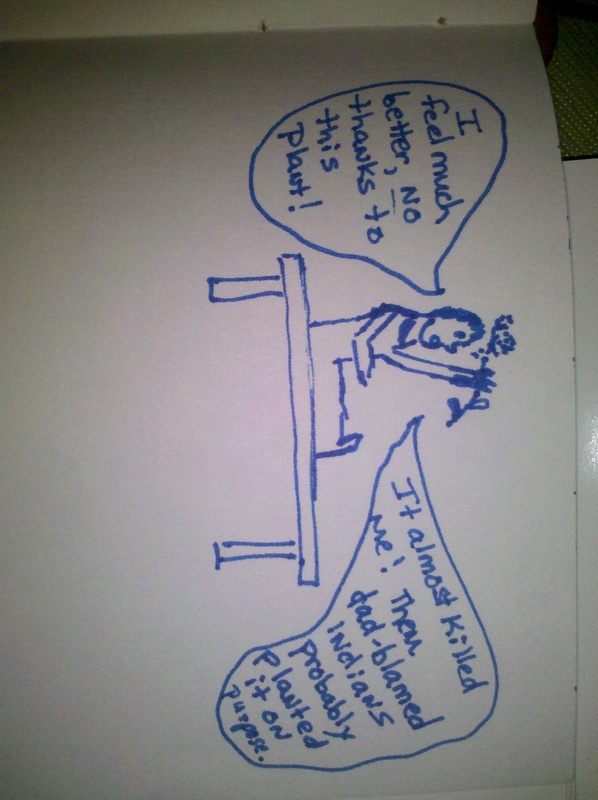 All I know is that I’m glad we stopped just pulling out all those plants by hand and discovered the joys of chemistry. Life is just too busy to pull weeds all day. And in this day and age, I can’t imagine any group of people who would be willing to come in and pull weeds by hand for what would amount to immigration-level pay. Oh wait. No, I’d rather take a bottle of Round-Up and apply liberally. I’m sure the goats and cows will just process that stuff right out. I’m not a big milk drinker myself, but you go ahead. I’m sure it’s safe. After all, it’s pasteurized. Here’s another question: Am I the only one who also wonders, in reading things like this, why livestock haven’t evolved any ability to detect the poisonous nature of the plant and avoid it? In fact, they did not go on. That question was thrown out with no further attempt to resolve it. Many. Thousand. Years. Really? 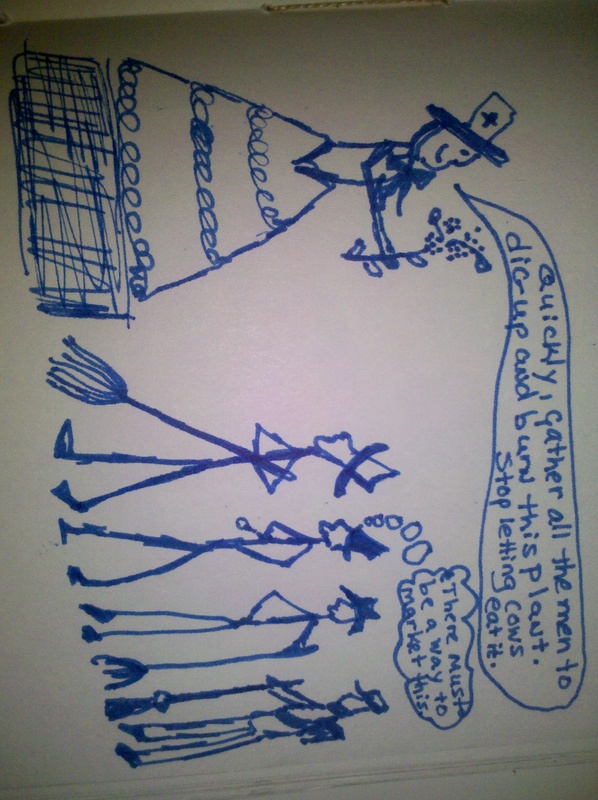 Our buddy Craig, who raises goats, has never had his goats croak from white snakeroot. 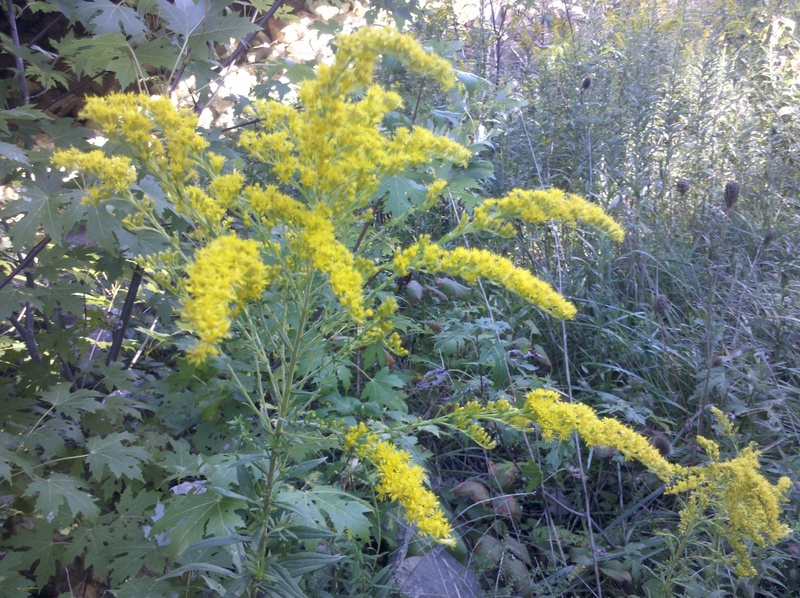 Granted, he hadn’t heard of white snakeroot until I showed him a photo and told him about it, but his goats graze freely in areas of multiple vegetation. Why aren’t they eating this poisonous plant and kicking it by the dozens? Has anybody actually ever asked Bessie WHY she ate the white snakeroot? Tried to get inside her head? Let’s see. I’m Bessie the cow. I’m foraging. I’m foraging. I’m foraging. 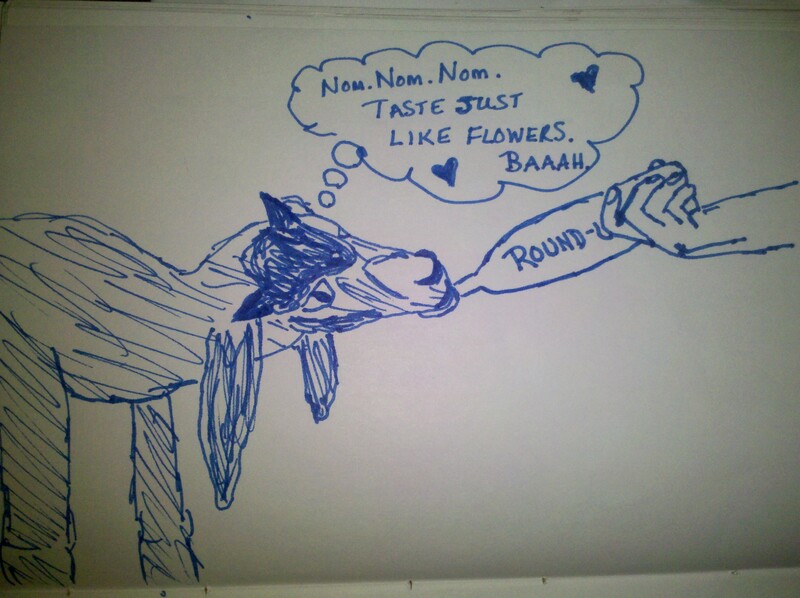 I’m running out of grass and nummy alfalfa. That darn Brutus is hogging the rest of the thistle and knapweed. What’s this? Smells funny. Looks like crap. But I’m starving and I can’t get outside this fence to eat anything else. Nom. Nom. Nom. Accck. Yeah, okay, so a little hyperbolic today, but seriously? However do animals survive without our intervention? If it will really take “many thousand years” for animals to learn to avoid white snakeroot, how have they survived this long. Let’s see. So the problem with livestock is that Europeans introduced them here, so they haven’t had time to adapt to avoiding white snakeroot, so we need to continuously protect them from themselves. Aha! 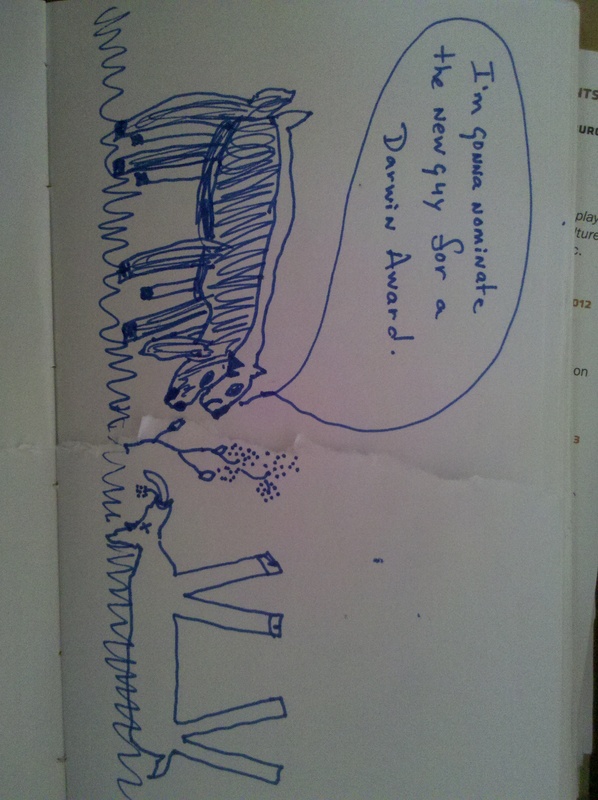 So our buddy Craig and his smart goats are winning this round. He, apparently has smart goats. At least give a hypothesis, an anecdote; tell me that Tom Hanks’ fifth-cousin Flannery Hanks was trampled by the second cousin of an ancestor of Kevin Bacon, who brought those early cows to America. Question three (and really the only question that counts): (a) Can you identify at least 2 “dead metaphors” in today’s post? (b) “Is there an overarching metaphor to today’s blog, and if so, did you “get” the metaphor, and the ones within it, or shall I bring back some photo-blogs to give our brains a break this week?” 😉 (Hint, this question can’t be fully answered until everything, including pictures and post script, have been accounted for). What do you think? Are you ill or “ill” informed? P.S. If you re-read looking for the answer to Number 3, I’m sorry. It was a trick question, because I never gave you that information. The answer is, well, as best I can discover: witches. Apparently folklore was so pervasive that fiction was much easier to swallow. Imagine that. P.P.S. Comments which do not allow for the assumption of my supreme intelligence and deadly irony (or that can effectively play a trump card attesting to my total deficit of said assets) will not be approved. Oh God! I’m just adding chocolate to mine, raising a glass to Tom Hank’s great, great, dead grandmother, Kevin-friggin-Bacon,whatever; and just hoping I don’t Griffin die…whatever! I got a trembly headache from that one. That’s awesome. I almost made a chocolate milk comment at one point but then forgot about it before I finished. Wow, Marla. That’s a lot of time on Google for one post! 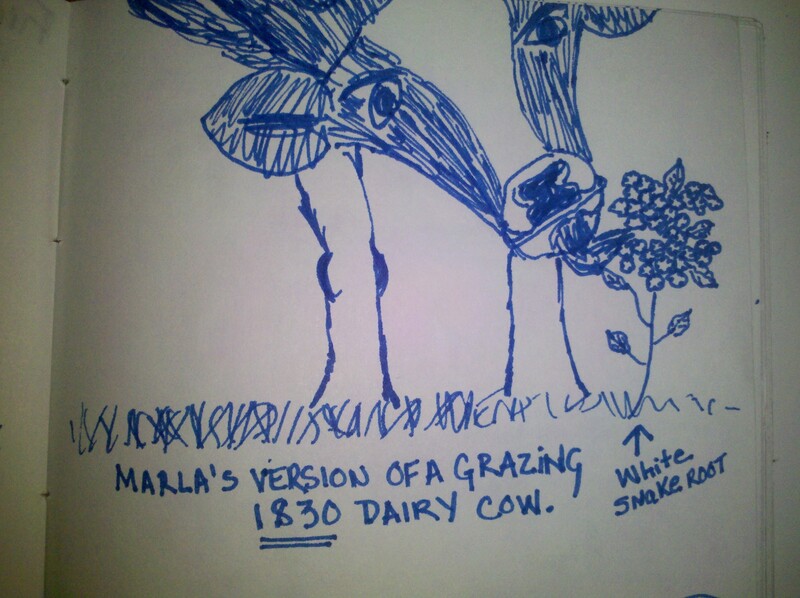 I admit that I did not assume pasteurization would protect us from white snakeroot, but rather the fact that most of the cows whose milk we now consume are very rarely given the opportunity to wander around a pasture eating any plants, let alone white snakeroot. They’re in confined animal feeding operations, so there’s little danger of eating the wrong thing there, unless you consider reconstituted animal protein the wrong thing! Hi Robyn, Thanks for commenting. Yeah, it was way too long for the low response. It’s such a tough decision each day on what to blog. Sometimes I get obsessed over looking into something (like this) and realize that for the return, it’s probably a really bad idea, since it ate into the time for my other writing, you know? Good note about the non-free-range of most cow production these days. I should have worked that into the post as well. It would have still worked within the metaphor points. Of course it would have taken another few hours because I would have gotten sucked into reading 100 more interesting articles, hahaha. I was just thinking about animal confinement last night, actually. We stopped at a restaurant on our way from Ohio to Pennsylvania. They source from a local cattle farmer, they state the acreage per cow and the type of food the cattle eat. It was strangely disturbing as well as reassuring.